In February I spent a weekend in Switzerland with a friend. We toured Basel and Bern, visiting the Federal Assembly and the legislatures of two cantons, and also witnessed campaigning for a number referendums (and more!) that would be held the next week. Votes on ‘popular initiatives’, which amend the constitution. These require the gathering of 100,000 signatures in no more than 18 months. To be approved in the referendum, they require both an overall majority of those voting and a majority of Cantonal votes. ‘Optional’ or ‘facultative’ referendums, which concern recently-enacted federal laws (I like to call these veto-referendums). These require the gathering of 50,000 signatures (or 8 Cantons – though I don’t think this happens in practice) in no more than 100 days from the publication of the act in question. For the act to be vetoed it merely requires to be rejected by a majority of those voting. When we visited there were four federal referendums about to be held, of which three were popular initiatives and one was an optional referendum. As it happened, all four votes would follow the government’s official recommendation: rejection of all the initiatives and approval of the federal law. The campaigns were very visible and there were posters were everywhere, both in public places alongside regular commercial advertising and on apartment balconies and small shops’ doors. We also saw many different leaflets, including some published by political parties. Far more visible than in the UK, which I also visited during the recent referendum – in London, the only sign I saw of the campaign were some flyerers at a tube station at rush hour on the day of the referendum. A number of Cantonal referendums were held on the same day as the federal ones, and we saw posters for these in both Basel and Bern. Basel-City’s late mediaeval rathaus (city hall), home to the cantonal legislature which also serves (with the exception of a handful of members) as city council. Unfortunately, we were not able to see the chamber, as the tour clashed with our visit of the Federal Assembly in Bern. Secondly, Bern’s legislature, the Grosser Rat/Grand Conseil. As far as we could tell there were no regular tours; we were let in by the janitor. Switzerland generally has relatively large legislative chambers. Basel-City, with a population of just under 200,000, has 100 seats, almost double what it should have per cube root; Bern, with a population of just over a million, has 160, 60% over cube root. The Confederation as a whole is just right with 200 in the lower house for a population of 8.3 million. The federal legislature is spectacular. The picture here is of the lower house, the National Council. 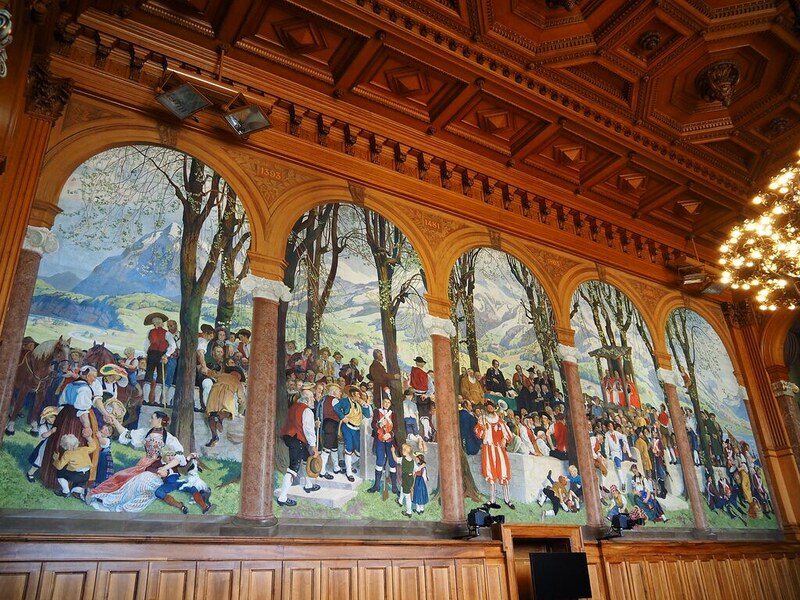 The upper house, the Council of States, was more difficult to get a good photo of so here’s a link; the wall painting is of a traditional ‘landsgemeinde’ or popular assembly that used to be common in rural areas. Today the practice persists as the form of government of two cantons, where the citizens meet once a year, while the agenda for that meeting, and most details of legislation, are prepared by an elected assembly. One of the members of the Council of States is still elected by their canton’s popular assembly every four years. Lastly, in Bern, we saw a poster for another campaign – we weren’t sure when we saw it, but it turned out to be for a by-election over two positions in the cantonal executive. Unlike the federal government, the cantonal executive councils are directly elected, mostly (as in Bern) through a two-round system, though proportionally in some cantons. The unusual thing in Bern is that there is one seat reserved for the French-speaking minority of the Bernese Jura – and this seat was one of the two up in the by-election. But, even more interestingly, it turns out this seat is not just reserved to candidates from that region, but the winner is the candidate with the higher geometric mean between the vote total in Bernese Jura and the canton as a whole – a fascinating and likely unique arrangement!